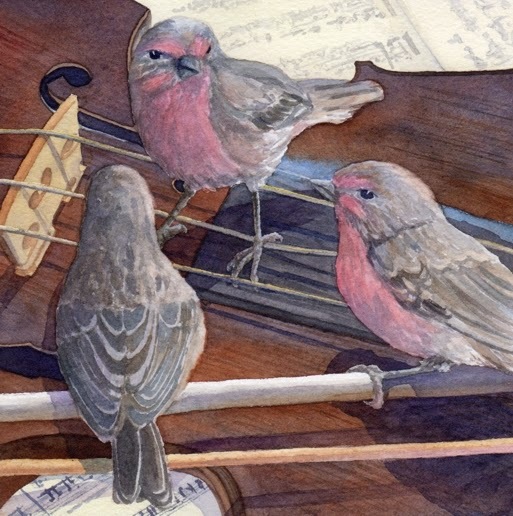 Day 5 of the 30 Paintings in 30 Days found me painting "Fiddling Finches". These finches seem to have found the perfect perch and who knows maybe they will be able to play a tune along with their singing! I enjoyed painting the fiddle and getting the surface to look like wood. I completed the fiddle and background music first. Then I started working on the birds. I chose to use the male finches with the tow birds facing the viewer so that their red chests would add some color to the scene.